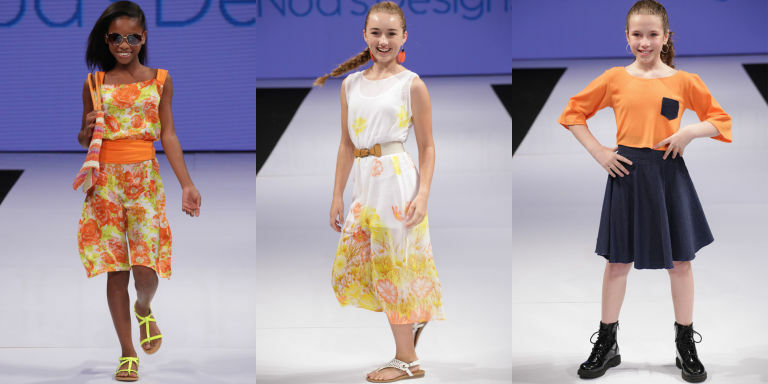 Make-A-Wish granted Noa’s one wish of bringing her designs to life on the runway. Harper’s BAZAAR: How did you start designing your own clothes? Noa Sorrell: I’ve been sketching clothes ever since I can remember, but I really only started designing and making my own clothes during my first round of chemo. I was not feeling well and I needed something to take my mind away from how sick I was feeling. I always wanted to design and sew clothes and suddenly I had all the time on my hands. HB: I love that your wish was to show at Fashion Week, how did that idea come to be? NS: When I found out I was getting a wish, I had already started sewing and I really wanted people to see my work. Sewing made me happy, and I wanted others to feel happy wearing my pieces. When Make-A-Wish® told me that I could participate in Fashion Week I couldn’t believe it. I never imagined that I would get to show my designs at Fashion Week. This is a dream come true! HB: What types of clothes do you design? NS: I design colorful, happy clothes mostly for teens, and also for adults. I design things that I could see myself or my friends wearing. I have designed sporty reversible tank tops for my friends to wear during sports events. When I design clothes, I usually try to make the piece according to them or their personality and the occasion that they will be wearing it to. NS: My style is modern and bold, but still cute and wearable. HB: What was it like planning your own fashion show during Los Angeles Fashion Week? NS: Very exciting! It was also very hard work because I drew everything, chose the fabrics, and sewed every single piece by myself. Me and my little Singer sewing machine. I also made an outfit for myself, my sister and my mom to wear at the show! HB: Tell me about your spring collection, what inspired the clothes you designed? NS: I was inspired by flowers blooming in the springtime and by the sunshine. I also wanted to make clothes that appeal to all styles and occasions. This is why my collection has prom dresses and skirts. HB: When did you first learn to sew? NS: My first time sewing was with my grandmother. Right before she died of cancer she made a dress with me. This was in December 2012. But I didn’t sew again until I found out that I was sick in January 2015. HB: What plans do you have next for your fashion line? NS: I really don’t know. I hope I can continue making exciting outfits. I have some fun ideas for fall and winter designs too!